It’s a good thing to have a Roman in the kitchen. They had a special on artichokes at the market today, and Claudio came back with a whole flat of them. 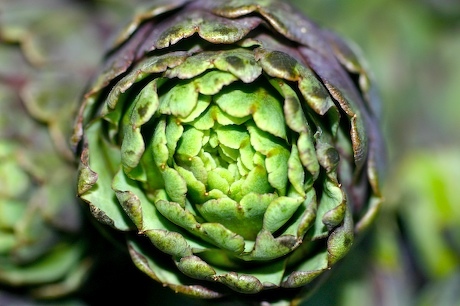 And Romans are passionate about artichokes! (Among other things!) For lunch today, he cooked them with a pork steak fillet (you don’t see cuts like this in the US) in a verdure (vegetable) sauce. Mmmmm….simple, homey, really tasty. No, not on the menu….just for us. Last night I introduced the kitchen gang to guacamole. I explained that we need to drink marguerites and be by a beach, but they were content to eat the guacamole…with foccacia. What? Do you think I could produce tortilla chips in Umbria?? It’s hot again. More air coming up from Africa, I guess; but the heat doesn’t have that “July-I’ll cook you till your dead feeling”; it’s dry and hot and you know it will cool down in the evening.